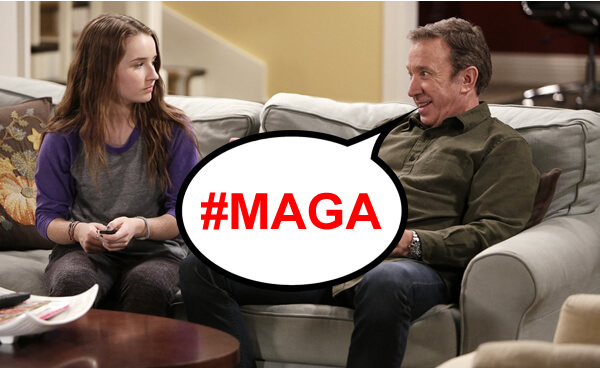 Tim Allen's Last Man Standing Cancelled for Political Reasons? After season five, unless a show is a blockbuster (like The Big Bang Theory or The Walking Dead) each additional season becomes more difficult to procure as actors, writers, technicians and others begin to earn pay bumps. The show has an aging viewership: Advertisers pay more to reach viewers under 50, as this demographic is seen as more lucrative since this is the age where people may still change the brands they purchase. ABC doesn’t own the series and therefore doesn’t collect ancillary revenues, which would instead go to he studio, which is Fox. Hence ABC has less financial incentive to move forward with the series than Fox. ABC would have the rights to advertising revenues, which as indicated above, were likely not so lucrative due to the show’s aging demographics. As Snopes has pointed out, Roseanne Barr is an outspoken Republican, and is scheduled to return to ABC. Also, the claim has been made that Last Man Standing was cancelled after Tim Allen admitted he attended Trump’s inauguration, making it sounds as if the cancellation immediately followed the statement. Roughly two months passed in between, and Tim Allen has been a well-known Trump supporter since early 2016. Despite the fact that the cancellation was likely a good business decision for ABC, it’s impossible to prove that politics didn’t somehow play a role in the decision since we can’t plumb the minds of the decision maker(s). However, there is certainly no reason to conclude that it was the reason, given the facts.